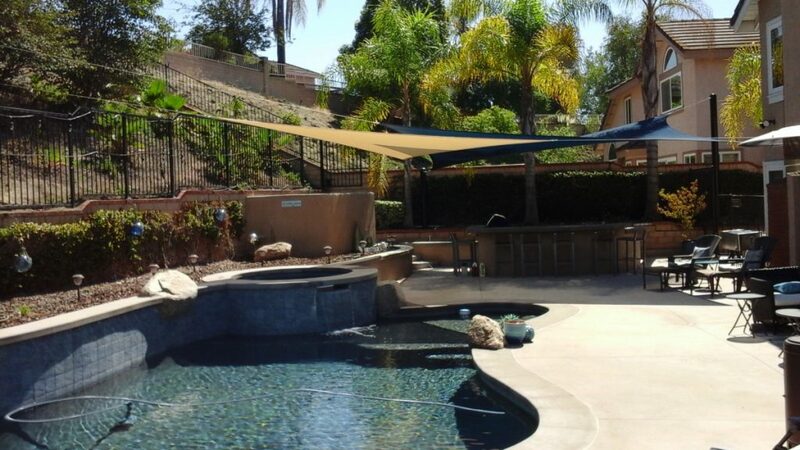 The Orange County shade sails for pools can keep your pool area protected and at the same time, provide you with protection from Orange County sun and from exposure to the UV rays. As professional shade sail makers, OC Shade Sails have discovered that there are a lot of advantages to using pool shade sails around the area. Below are the top benefits that you can get to enjoy when you have shade sails installed over your pool. 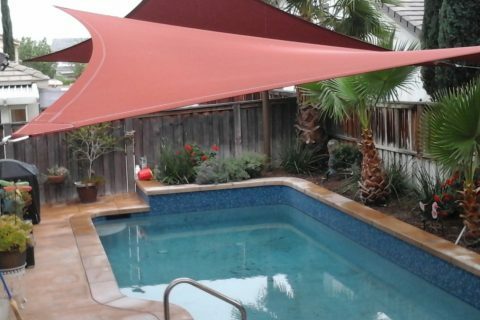 Orange County shade sails for pools are popular, modern, and look very fantastic. They also look elegant and classic. You can select from a plethora of colors to fit your taste and blend in with your entertainment and alfresco area. 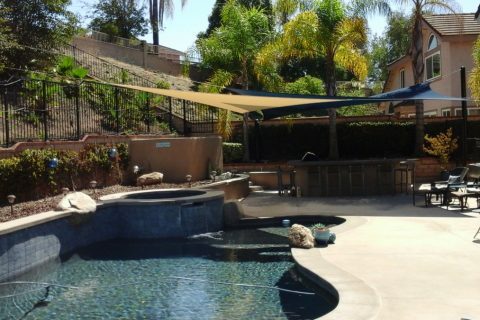 During summer months in Orange County, having a shade sail installed over your pool is a must for you to stay protected from the sun’s heat and damaging UV rays, specifically during midday. You can also enjoy taking a dip in your pool anytime you like with no need to cut short your time in the pool just because the day has gotten too hot. 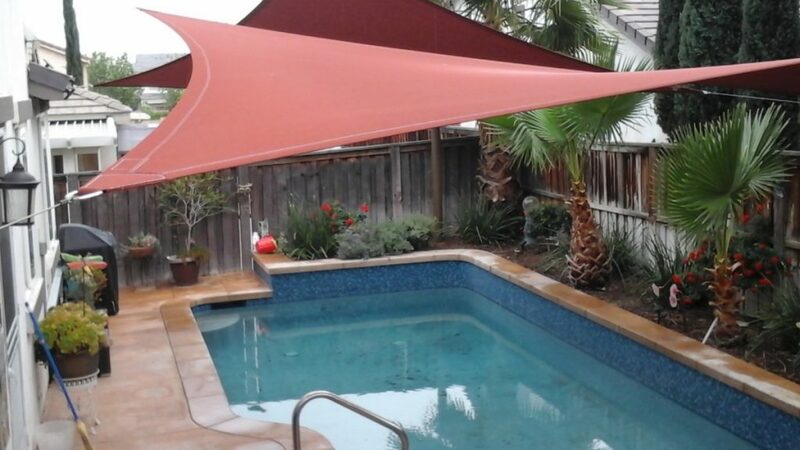 Orange County shade sails can keep your pool protected from any garden debris which makes it easier and more convenient for you to clean it, thus saving your time as a result. Quality shade sail designs can also be very durable and have the ability to withstand inclement weather. Most of the shade sails from OC Shade Sails are made using top of the line waterproof fabrics that are ideal for pool areas. Quality shade sails will let you and your whole family enjoy hours of fun spent in the pool and still stay protected from harmful ultraviolet rays. Shade sails can offer a high level of protection from sunburn and UV protection from the sun. This means that you don’t have to apply your sun block as often as you do when you are at the beach if you have a great shade sail covering your pool. OC Shade Sails offers custom designs to let you pick the specific style you want for your shade sail. It will all be up to you as to how much of your pool you want to cover. This means that you can cover only the entry or shallow end, or you can cover your entire pool. An entry level coverage lets you tie in your pool shade sail nicely with the other parts of your entertaining area. This can cover pool lounges and daybeds as well to let you relax by your pool out of the scorching sun. Quality Orange County shade sails won’t go out of style. They create an allure and add glamour to the pool area and at the same time, it keeps you and your whole family protected from the UV rays and heat. With OC Shade Sails, Orange County residents will be able to enjoy and have fun at their pool for a longer period of time.